SPS started manufacturing of interlocking concrete pavers (ICP) in 1985. ICP from Sunway Paving Solutions have been widely used at the container yards in the five major ports in Malaysia – Johor Port in Pasir Gudang, Johor, Pelabuhan Tanjung Pelepas, Johor, West Port in Pulau Indah, Selangor, North Port in Klang and Kuantan Port in Pahang. 2. 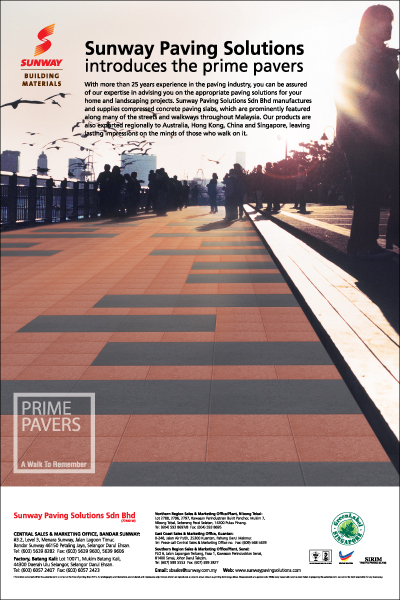 Driveways for commercial housing estates, shoplots, universities and colleges. In 1997, SPS started manufacturing of compressed concrete slab (Eurotiles). Eurotiles have been installed in excess of 600,000 sq m in Putrajaya – Malaysia’s New government Administrative Center. Its also been widely used for all the pedestrian walkways in and around Kuala Lumpur and other major towns. Eurotiles have also been exported to Singapore, Hong Kong and Australia. Our products have been tested and certified by SIRIM of Malaysia and PSB of Singapore.